The love child of Arnold Schwarzenegger is spotted with his new girlfriend Nicky Dodaj, while his half-brother Patrick mingles with his own friends at the music festival. 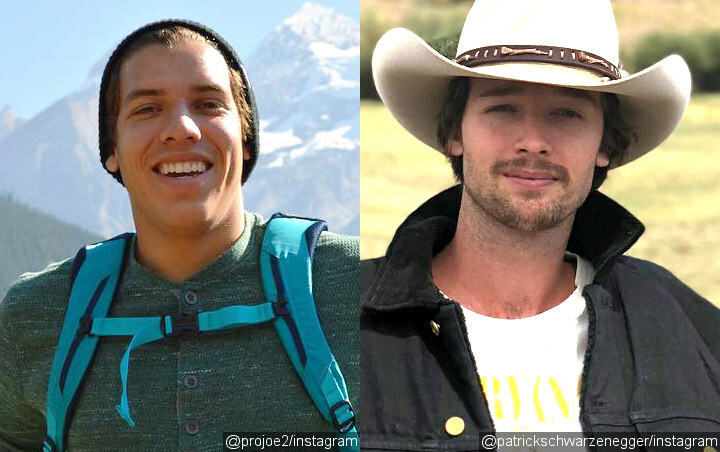 Joseph Baena and his half-brother Patrick Schwarzenegger attended Coachella separately over the weekend. The love child of Arnold Schwarzenegger and the 25-year-old actor/model were not spotted hanging out together while they both stepped out for day 1 of the annual music festival, Saturday, April 13. Joseph was pictured arriving with his new girlfriend Nicky Dodaj and some male pals. He rocked a white Budweiser T-shirt with a pair of cuffed dark jeans and matching black-and-white sneakers. He accessorized with a red-and-white scarf. His girlfriend Nicky also kept things casual yet stylish in a black crop top and a pair of boot cut jeans with white printed flame design. She teamed the outfit with black shoes, while she carried around a pink bunny. Joseph appeared to have a lot of fun at the festival. He posted on Instagram a picture of him showing a playful pose with his friends. The 21-year-old also posed for a photo with his girlfriend, putting his face close to hers as if he’s going to kiss Nicky. Patrick, meanwhile, hung out with his own group. The son of Arnold and Maria Shriver sported a simple white T-shirt with a pair of flamboyant floral pants to keep with the festival’s spirit. He also wore a white round hat, white sneakers and orange-framed sunglasses. The “Midnight Sun” star was all smiles as he held a glass of drink and chatted with friends.